What magnets do I need to hold up a panel on a vertical surface? Or a magnetic shelf? How does that relate to the listed Pull Force for a magnet? The answer is complex, and depends on a number of details concerning what you’re holding up and how you set things up. Our advice helps explain the factors involved without resorting to complex math. When using magnets to hold an object to a vertical surface, like a wall, there are two things to keep in mind: leverage and friction. 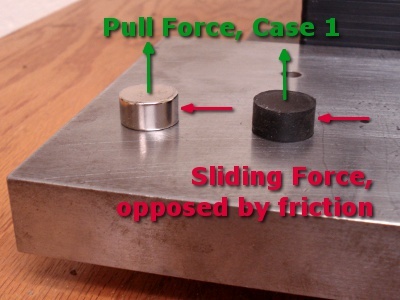 Friction: The magnet only provides a force towards the steel wall. It does not oppose the downward pull of gravity. Only friction prevents it from sliding down. In picture A, the force is close to the wall. 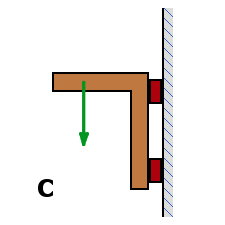 With enough force, the magnet slips as the friction between the magnet and the wall is overcome. Friction forces can be difficult to predict, as described in our earlier article, How much will a magnet hold? Leverage: If the magnet sticks well and doesn’t slide, the weight of the thing you’re holding tends to rotate it off the wall. The farther out from the wall the object sticks out, the more leverage it has to try and pry the magnets off. 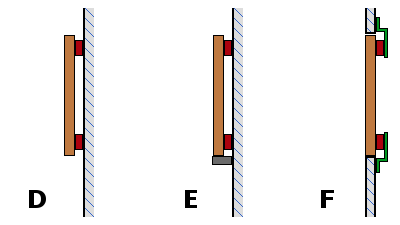 In picture B, the increased leverage gives the force the ability to rotate the magnet off the wall. A quick video demonstration might show these concepts more clearly. The video below uses one of our TT-8 telescoping pick-up tools to show these forces. We can add friction if we put some grippy layer of material between the magnet and the steel surface it is attracted to. Our Rubber Coated Magnets are a good example of this. Or, we’ve also added a layer of sticky tape to a magnet, or adhesive-backed polyurethane material like 1867T22 from McMaster-Carr. UPDATE: We haven't tried it yet ourselves, but a customer recently pointed out a roll of polyurethane tape also on McMaster, part number 7350A4. At 0.009" thick instead of 0.014"thick, it's thinner, so we'd expect more pull force. Plus, it's about one-fourth the cost! 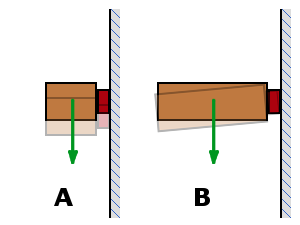 Either way, there is a trade-off when adding a layer of material to increase the friction. Inserting a grippy material or using a rubber coated magnet does increase the friction between the surfaces, which can prevent it from sliding down. However, since the magnet is now farther away from the steel surface, it has a much lower pull force. Consider the DC6-N52 disc magnet, with a pull force to a steel plate of about 29.7 lb. A rubber coated DC6BR-N52 magnet with the same outside dimensions has about half of that pull force. (To be fair, the magnet is also smaller inside the rubber coating.) Even so, there can be applications where the rubber coated DC6BR-N52 will resist sliding down a wall better than the stronger DC6-N52. The more your object sticks out from the wall, the more leverage it has to pry the magnet off. One way to beat the leverage problem is to keep your object as shallow as possible. The closer its center of gravity can be to the wall, the less magnetic strength will be needed. The deeper the shelf, the easier it will be to overcome the magnets and fall off. Another good strategy to oppose this rotating-off failure is to give the magnets more leverage. Use more than one magnet with some vertical distance between them as shown below. The greater the distance between the magnets, the more leverage they have against the tendency of the object to rotate out. We are often asked about what magnets to use to hold up a panel. It might be a concealed compartment in a piece of furniture, a door for access under a hot tub, a closet door, or many others. In any case, the goal is to hold up a removable panel with magnets. What's needed is enough magnetic strength to overcome the friction and leverage of the panel. The problem is that big and heavy panels sized like a door need a LOT of magnetic strength to keep it from sliding down. A light panel that weighs 5 lb might require magnets with 30-40 lb of pull force to keep it from sliding. When the reason for using magnets is to make the panel easy to remove, having to pull with 50 or 100 lb of force isn’t exactly user friendly! We offer magnets that provide that much force, but nobody wants to pull with 100+ pounds of force to remove a 15 pound door. In most cases, it makes sense to solve the sliding problem with a mechanical solution. If the panel rests on some mechanical stop, as shown, the weight of the panel is held up by the stop instead of the magnets. It no longer relies on friction to keep it from sliding. In these cases, you only need enough magnetic strength to keep the panel from tipping outward. The magnet size and strength is chosen to set the force required to remove it. A typical refrigerator door requires about 5-10 lb of force to open it, which is a pull-force number we keep in mind when sizing this sort of thing. Below, picture D needs enough magnetic force and friction to prevent the panel from sliding. In pictures E and F, the panel is constrained by a stop on the bottom. The magnets don't need to hold up the entire weight of the panel. All this general advice is great, but what magnets should I actually use? It does depend on the size, weight and shape of the thing you plan on holding up. For applications like these, our Countersunk Magnets and our Mounting Magnets are popular choices. From our article about How much will a magnet hold, we get a rule of thumb to help estimate how much magnetic pull force is needed to hold up a panel as shown in picture D above. If we assume the coefficient of friction is 0.15, we divide the weight of the panel by 0.15 to get the total pull force needed. For example, let's say we have a 10 lb panel, hanging as shown in picture D. What magnets should we use? Take 10 lb, divide by 0.15 to get almost 67 lb. So, we need that much pull force from the magnets. If I want to use four countersunk ring magnets, one at each corner, we would need at least 17 lb of pull force from each magnet (67 divided by the 4 magnets). That means I would probably pick the RX033CS-N magnets. It's a rough estimate, but it usually works well. If you would like advice about your specific application, you can email one of our engineers for help. We can offer advice to help narrow down your options, but trying it out with a few magnets might be the best way to be sure.